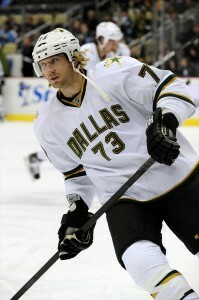 Michael Ryder is having a career year with the Dallas Stars. This is a surprise, though it really shouldn’t have been. When Ryder signed a two-year deal last summer with the Stars worth $3.5 million annually, he elevated himself from a third-line, secondary scorer on a Boston Bruins team with plenty of offensive weapons, to a first-line winger on a team that was losing star forward, Brad Richards, to free agency. Ryder was expected to become a primary scorer, a signing that would essentially have to replace the same point production that was lost when Richards left for the New York Rangers. That’s right—Ryder, who surpassed 60 points only once, his rookie year in 2003-04 with Montreal, was supposed to replace the production of Richards, a player who’s only had one season out of ten under 60 points, an injury-plagued year in 2008-09 where he played only 56 games. No surprise, then, that Ryder has 35 goals and 27 assists for 62 points with Dallas while Richards has 24 goals and 37 assists for 61 points with New York in the same amount of games played. Funny how that happens. Ryder is a prime example of a secondary scorer providing first-line points. Think of it as the antithesis of scorer-by-committee—rather, scorer-by-necessity. Ryder’s not the team’s leading scorer (Loui Eriksson has 26 goals and 44 assists), but he’s a player who would play on the top line with other big point-producers, Jamie Benn and Mike Ribeiro. In Boston, Ryder would be stuck pivoting wing with guys like Chris Kelly, Rich Peverley, or Blake Wheeler, who are all good players on their own, but not a team’s top point-producers. The scorer-by-necessity format has certainly helped the Dallas Stars become successful this season and they’re not alone, either. For the Stars, the amount of points an individual has scored dips after the top four of Eriksson, Ryder, Ribeiro and Benn. It may defy the rules of good depth being a key ingredient of a successful team, but let’s look past that for right now. The Phoenix Coyotes are another example of a team that has scorers-by-necessity mentality. Take for example Radim Vrbata, second on the team with 58 points (39-year old Ray Whitney, but a surprise 30-goal scorer. On a team with more offensive prowess, does this happen? Probably not. Vrbata spent time with Whitney and Martin Hanzal as linemates earlier in the season, a point where most of his goals were scored. Though he just scored his first two goals in 12 games on Thursday, it’s important to understand that he’s only played in 73 games, meaning, he had 30 in 61 games. What’s more staggering is the fact that Vrbata is first in the league with 11 game-winning goals, ahead of the ten scored by Steven Stamkos and Johan Franzen; pretty decent company. 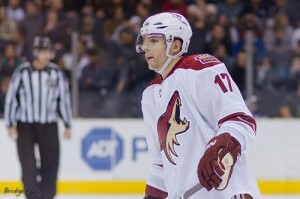 Not only is Vrbata the leading goal scorer in Phoenix, he’s also a clutch player. Not bad to have a 7th-round pick in 1999 be in the top-15 goal scorers in the NHL this season. The Coyotes and Stars have both had surprising seasons. While it could be contributed to their goaltending and depth, we’d be remiss if Vrbata and Ryder weren’t given credit for the major contributions that led to the success of their teams. Before the season started, The Hockey News predicted the Stars and Coyotes to finish 13th and 14th in the Western Conference respectively. Now, both are gunning for the Pacific Division title as previously predicted powerhouses, San Jose Sharks and the Los Angeles Kings (predicted 2nd and 4th in the West), fight for a final playoff spot. Compare the two lineups on paper and you’ll see more reasoning why the scorer-by-necessity trend is helping teams become successful rather than relying on depth or the so-called ‘superstars’ to put up points. Players on marginal playoff teams are forced to step up and produce points. They’re given more opportunities to play on first lines and with other players who are considered the primary scorers. They get more ice-time, play more minutes and get more opportunities for scoring chances. It’s easy for a team to be successful when they have strong depth, good goaltending and perennial scorers leading the way. It’s what’s happening with the Rangers, and to some extent, what happened with the Bruins last season. Therefore, it’s no surprise that Richards’ point production has dipped, especially with guys like Marian Gaborik, Ryan Callahan, Derek Stepan and Carl Hagelin sharing some of the scoring. With Boston, there’s a good reason why you hardly ever see a Bruin in top 25 scorers list. The team’s depth caters to a scorer-by-committee format and it’s the reason why Kelly, a defensive-forward, has a career-high 19 goals as the team’s third-line center. How this will translate into the playoffs is anyone’s guess. The scorer-by-committee trend worked for the Bruins’ offensive game last year as it did for the current Nashville Predators’ season, defensive and goaltending capabilities not included. It’s amazing to think that the hopes of a team’s offensive game in the playoffs will be held in the hands of guys like Radim Vrbata and Michael Ryder. At least we know Ryder’s done this before. Follow Mike on Twitter for more NHL updates, news and commentary.